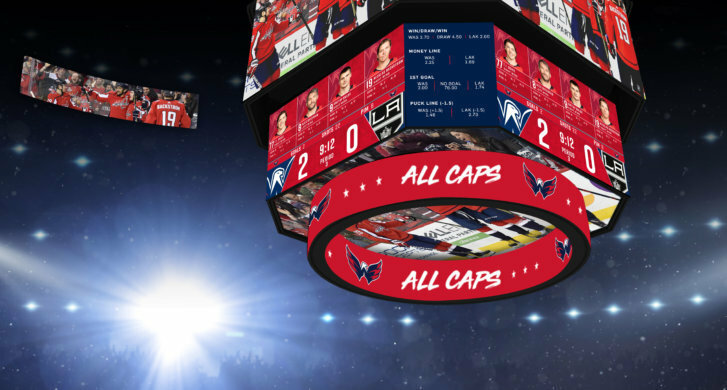 WASHINGTON — Monumental Sports & Entertainment, which completed a $40 million renovation of Capital One Arena last summer, is investing another $15 million to make the arena more of a digital experience, including the largest center-hung scoreboard in an indoor arena. Concessions will get another upgrade. Phase II renovations will start this summer and be done by this fall. The additions will include one of the largest 360-degree continuous video screens in a sports venue. The new center-hung scoreboard will have more than 7,000 square feet of LED display and eight display areas for live game video, real-time stats, scores and updates. And for the first time in an indoor arena, Capital One Arena will feature a “gravity-defying SkyRing display,” with 9,000 square feet of LED video wrapping the roofline of the arena’s interior. It will be the largest such display in any U.S. arena. The 1,230-square-foot circumference will wrap the arena with more than 9,250 square feet of LED display. Other digital additions include new end zone displays and LED lighting that can change colors. As for concessions, the Phase II plans call for updates to the 200-level concourse with new concessions, including The Exchange — a walk-in market — and TLC (Tenders, Love & Chicken) with homestyle chicken tenders, fries, chicken sandwiches and a self-serve sauce bar. Monumental said it’s also working on partnerships with D.C. chefs for more dining options. There will also be a Devil’s Backbone lounge on the 400 level. Lower rows will be added to the PwC Club. Last summer’s renovations, and those planned for this year, are privately funded. Capital One Arena is 11th in the nation and 24th worldwide in the rankings of top-grossing venues.